I am of the mind that one’s life story is predetermined before we arrive on the planet. The Adventures of Ralph Rocket: My Life in Music, By Michael D. Husser proves just this, for his journey has been one of consistency in being able to learn to play music and share the gift of joy through music. It encompasses working with “ famous “people, including: Little Richard, Buffy Sainte Marie, Johnny Carson, and “almost famous” people including: Walter Hand, Tia Carroll, Jeb Brady, and myself. Now that Ralph/ Michael is in his early 70’s, it is my privilege to share his story with you as his friend and musical partner of five years and 4 CD’s later in The AH Factor Band, and now as his publisher. I am a better person and musician for knowing him! I am of the mind that one’s life story is predetermined before we arrive on the planet. 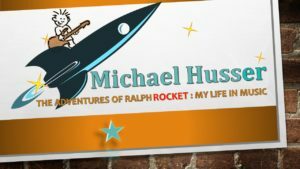 The Adventures of Ralph Rocket: My Life in Music, By Michael D. Husser proves just that, since his journey has been one of consistency in being able to learn to play music and share the gift of joy through music. It encompasses working with “ famous “people, including: Little Richard, Buffy Sainte Marie, Johnny Carson, and “almost famous” people including: Walter Hand, Tia Carroll, Jeb Brady, and myself. Now that Ralph/Michael is in his early 70’s, it is my privilege to share his story with you as his friend and musical partner of five years and 4 CD’s later in The AH Factor Band, and now as his publisher. I am a better person and musician for knowing him! I was born in San Francisco, CA on June 21, 1946, exactly one year after the chartering of the United Nations in San Francisco, and one mile away from that location. Two days after my arrival, I was brought to my parents’ home in Richmond California. My father, George Husser, was a pediatrician and an internal medicine specialist. He had been the physician for FDR in WWII and came back to the Bay area to start his medical practice. In fact, being a resident at UCSF Medical Center when I was about to be born, he had my favorite uncle Chico drive my beautiful mother Helen across the Bay Bridge during labor, so dad could take advantage of having me born under the auspices of the hospital he worked in, and so as to receive the benefit of a discount in hospital fees! Even back then birthing babies was not inexpensive! My family included my older sisters Kate and Peg, our younger brother Tim, our parents, and of course myself. My parents met in college and were graduates of UC Berkeley – that bastion of liberalism, socio-political contention, and deep thought. We were always reading something in our home, which helped me to become a very well-informed person. Although I was not aware that I was able to soak up and retain information being the small sponge that I was, my sister Peg used to remind me “not to scare them” when recapping historical context or political fact. Years later, remembering this phrase served me well in my secondary career as an high-school social studies teacher. But I digress. Herein want to get to the nasance of Ralph Rocket my musical alter-ego. Aside from my keen curiosity of all things written, I also possess, and still do, an immense need to understand how things work. At the lofty age of 8 while attending my grade school’s carnival, I noticed a man sitting next to the stage. He had a green box connected to a microphone that was on the stage where one of my female classmates was singing. Boldly asking the man what he was doing and what the green box was for he kindly explained to me that he was running what was called a “P.A. system”. Showing me that by moving a dial on the amplifier I could make the mic louder or softer, I turned the knob. Suddenly the girl’s voice got very loud in the room and as she looked over at me to see what was happening I realized it would be a good thing to be a PA system operator. Not just because pretty girls checked me out, but because I could control what came out of (or didn’t), from this little green box! This was my first introduction to live sound. I was hooked. Around age 10, I got the idea to design a recording studio in my father’s house. Obtaining some graph paper and measuring tape, I measured my bedroom, the bedroom next to mine, and the closet in between the two rooms. I then drew the studio in one room and the control room in the closet, with my room as part of that control room. I even measured the window that needed to go into the wall between the two rooms. Presenting this drawing to my father, to this day I am grateful for the fact that he said to me “we don’t have time to do it right now, but it’s a terrific idea!”. His support of my creative mind and vision helped set me on my path toward professional audio because he validated me in his polite and astute way as my dad. Near this same time, my grade school planned a talent show for the students. At the urging of Kate and Peg, I performed a pantomime of a record called “The Hat I Got for Christmas is Too Big”, made popular by Stan Freberg. I wore my first communion outfit: white pants, a white shirt, some sandals and an over-large sombrero. In advance of lip-syncing becoming an art form, I practiced mouthing the words to the song in front of a large mirror in our home dressed as Speedy Gonzales. On the day of the show I performed the song in front of the assembled students in the school auditorium – without stage fright!. When I was finished I received large applause, and was given a ribbon. I did not win the event however, the ribbon did say “Honorable Mention”. In my 10 year old mind I was convinced that this was just as good as earning first place because A) I was now “honorable”, and B) I had before been mentioned, at least not in this capacity. This was my first experience on stage. Speaking of stage fright, I am somewhat unique in that I have never experienced what is for many a reason to be nervous on stage. In fact, the biggest crowd I have ever spoken in front of has been over 5,000 people, and it didn’t bother me at all. This lack of fear makes me a natural ham. I encourage anyone with stage fright to keep on struggling through it, because eventually you will experience the joy of your ham being baked, too. In the fourth grade, my teacher Mr. Skelton, (no relation to Red), taught us to play an instrument called a Flute-O-Phone – an entry level to playing recorder, and every parent’s nightmare if blown out of tune. The class learned Christmas songs and we played them for the school. That was my first experience playing an instrument in front of an audience. In the fifth grade, our class produced for ourselves a small play in the classroom. The name of the play was “The Doughnut Shop”, and yours truly played the part of the proprietor. Other students played characters who came to the doughnut shop to talk to me and of course to buy doughnuts. This gave other students the opportunity to be actors, with me as their foil. It also meant that I had more lines than everybody else. All I had to do was put my script papers down on the counter of the doughnut shop and read my lines. During one of the exchanges, one of the students got stage fright and forgot their lines. The poor soul walked off and sat down in the back of the room, very embarrassed. The “audience” then (as audiences do) looked at me because I was still in front of them. They knew what had happened, I knew what had happened, but I had to remain in character. So I started making up a monologue about how nice it was being the proprietor of the doughnut shop, and how I was going to keep the place nice and tidy until the next student was ready to say their lines. In this way, I kept the show going. I did not know anything other than I needed to make something up, and I did. When our little play was over, the teacher,Miss O’Brien, told me I was a natural actor and performer. These experiences on stage fomented my creative bent and helped lay the groundwork for a professional career as an performer, musician, and sound/video engineer. 1959 – a year when 75 confident and not so confident high-schoolers attended Salesian High in Richmond CA. Given that this was the school’s inception year and that it was a Catholic school, I would say that we were all “immaculately chosen” by a higher power to attend. For me the higher power was my Grandmother Husser, who made it quite clear to my now remarried father, that each of her grans were to attend some sort of Catholic institution of higher learning, especially those good-fer-nothin’ boys of his, Michael and Timothy. Who knew that expressing an interest in wanting to play music would earn me a prestigious spot on the Master’s punishment roles – but I digress! I had previously attended public school where boys and girls mingled in class together. As natural as this was to me, to Grandmother it seemed I should be in a “safer environment”. So I was removed from the very environment where I had thrived. Not wanting to incur the wrath of my gram and to give my father some piece of mind, I complied with little complaint. Besides, Salesian was positioned directly behind Richmond high, where I continued to consort with those public school students I remained friendly with, as time and the Priests allowed. I had no fear of girls and I was quite surprised that many of my classmates did not know how to behave around girls at all. We were invited to school dances at Richmond High, which I went to but my classmates were very nervous about attending. Presentation High, which was the all-girls Catholic school, was in Berkeley, CA. Eventually we “saints” of Salisian and saintlier girls of Presentation began dating. I met my high school sweetheart in my junior year because she was a cheerleader for our school along with three of her friends. Salesian didn’t have female cheerleaders. In my Junior year I became the head cheerleader of what became Salesians all-boys cheerleading squad. This was a true vantage point for me since it once again placed me in front of an audience and allowed me to talk to girls! During my Senior year I became the director of school plays for the Salesian drama department, and a singer in the school folk singing quartet. The group was called “The Farallon Island Singers”. We performed songs by the Limelighters and Kingston Trio along with other popular folk tunes. In yearbook photographs I am seen with the folk group and in other photos I am holding a guitar although music formal lessons were forthcoming. I was also the MC of the folk group. I would tell the jokes and introduce the songs. This went on until our graduation in 1964. It was the last time that I attended a Catholic mass. After graduation I took a job at a local shoe store, selling women’s shoes. It was good to be back around normal females without the idea of guilt inferred by a Priest. I received a guitar and guitar lessons from my parents as a graduation/birthday present, since my graduation occurred close to my 18th birthday. When I took my first lesson, the instructor realized I could not use the little finger of my left hand, and could not therefore make guitar chords. He just happened to be the bass player in the local rock group in Richmond. Having been paid in advance, he was loathe to return my lesson fees and instead said “Learn to play electric bass. You only need 3 fingers”. Not knowing anything and being susceptible, I agreed and traded in my guitar for an electric bass and amplifier. I took 2 additional lessons from him and then started playing and exploring the instrument on my own. I had been “playing” the bass for 3 weeks when I received a phone call at the shoe store. I took the call in the stockroom. The caller said “My name is Larry Sanchez and I have a band that is playing tonight at The Center. We need a bass player and we understand you purchased a bass from the local music store.” I told him that was correct but that I had only been playing for three weeks and couldn’t really play well yet. However, I could sing. Larry said, “We don’t get paid unless there’s a bass player in the band. All you’ll have to do is stand there and sing with us”. Larry and his father picked me up in their car with my bass and my amp in front of the shoe store and we drove to the American Indian Center in San Francisco. The Center was a second story ballroom in a building located at 14th and Mission in the city. I “played” and sang in front of 200 Native Americans. I was the only non-Native other than the drummer in the room. I was paid $22.50 and since the payment on my bass and amp was $18.00, I felt that I was now really in show business! After the dance, the drummer wanted to fire me immediately (and rightly so) since he wound up holding down the back beat for most of the night. But Larry, as band leader, saw my potential and refused to fire me. I ended up rehearsing with Larry every day for hours. He taught me blues patterns on the bass and we studied the recordings of Jimmy Reed and other blues artists. During this time I had also started classes at Contra-Costa College (CCC) in San Pablo CA , intending to take courses in order to eventually become a lawyer. After I started college, my father and I had a disagreement, and I was asked to leave the family home. My father gave me what he had in his pocket at the time, which was $14.00. Fortunately I was taken in by a high-school friend’s family, who were full-blooded Sioux Indians. The mother was a nurse at the local hospital and also knew my father. She obtained a job for me in the dietary department. I worked there while going to school and continuing to play music with Larry Sanchez. His family were originally from Acoma Pueblo. I moved from my classmate’s family’s home to Larry Sanchez’s family’s house and ended up living with his family for about a year. Their home was a bungalow in the middle of the Santa Fe railroad facility also known as the Santa Fe Indian Village. I was the only non-Native to my knowledge to have lived there. The family moved from Richmond back to New Mexico a few years later and I also ended up living with them at Acoma Pueblo. Larry’s tribe came from the “Land of Enchantment”. The state of New Mexico got that phrase from “enchanted mesa” which is located on Acoma ancestral land. The tribe had been living there for over one thousand years. Acoma is the oldest continuously inhabited Native American city in North America. I was very proud to live with them. I was also proud to become a permanent member of The Enchanters Band. Before moving back to the reservation, The Enchanters included Larry on guitar and vocals, Wayne Neckel on drums and vocals, and a great guy named Vic on sax and vocals, whose last name eludes me at present. We also performed at Contra-Costa College and other venues. The band was also involved in a “band battle” at El Cerrito High-School. We only agreed to perform at the contest if we were paid for our time. The promoters agreed and told us not to tell any of the other bands. Included on the bill was a band called the Blue Velvets, now known as Creedence Clearwater Revival. The Enchanters won the band battle. John Fogerty, lead singer of the Blue Velvets, insisted that their band was better than ours. Although we won that contest, time has proven that CCR was a much more lucrative group. I played with The Enchanters until around 1967 when Larry received his draft notice to go to Vietnam. He joined the Air Force. When he left, I was living in Richmond. I had rented a room on Costa Avenue, which was located by the hospital where I was working. After leaving my job at the hospital, I obtained a job at Kawneer Corporation which manufactured aluminum doors for buildings. I ended up in the shipping department and shipped their products all over the world. While employed at Kawneer I was asked to join the management group, but politely declined because I didn’t want to be in an office. My ambition was to play music. I continued playing in various groups in the Bay Area. Richmond was known for Blues, Zydeco and Cajun music because many of the people who resided there came from their home states to work in the shipyards during WWII. In the adjacent community of San Pablo, the same was true, except the people played and enjoyed country music which also represented their lives. The music that was played in these communities was very important to the people because it also reflected where they had come from. These forms of music were presented in their traditional styles. I felt privileged to play with them because I learned the authentic methods and phrases necessary for these kinds of music. I would play Country on Friday nights, Blues on Saturday nights, Rock and Roll music Sunday afternoons, and maybe some Jazz when time permitted. As my musical career progressed, I was able to play with many well-known Blues, Folk, and Country artists because of my ability to play the authentic styles. I didn’t know at the time how important my experiences would be later on in my musical life. I thought everybody played authentically because I was surrounded by people who played this way. Even today people will compliment me by saying that I still play “old school”. The Postmen were a local group who played various dances and events around the East Bay Area. I was two years older than everybody else in the band. The group has been remembered as a part of the “East Bay Garage Bands of the 1960’s”. They are mentioned in the literature that is distributed for the garage band reunions that occur each year. At the reunion members of the various groups get together and perform their popular songs of that time. I continue to keep in touch and occasionally play at this event with my good friend and multi-instrumentalist, Walter Hand. Walter is also the leader of a group called the Blue Hand Band which performs in the Bay Area. Mikey’s was located on 13th Street in San Pablo, CA. I played country music with musicians for whom the music represented their lifestyle. On Sundays there would be a get-together at the club to play music. One time an older gentleman got up on stage with his guitar, which was held up by a string, rather than a strap. His overalls were pressed, his shirt was white, and his working shoes were polished. He told me, ‘I’m going to play a chord, son” and I said “Yes, sir”. We started the song, which was a country classic song by Jimmy Rogers and I quickly realized that he was in the key of C. When the song was over, I asked him what key the song was. He said, “I don’t rightly know, I just told you I was going to play a chord”. I then learned quickly to read the left hands of the guitar players. To this day when I perform I always try to stand on the right side of the stage (left side as the audience sees me) look to my left, and am able to see the left hand of the guitarists. If they’re hand is over the first dot of the instrument they are either playing in C, G orF. If their hand is voer the second dot they are playing either an A, D or a G. This method of observation has stood me in very good stead. The only thing that would mess me up was when a guitar player used a capo. As important as the music and songs were to learn (sometimes instantly), it was also just as important for me to learn about the people who the music represented, and for whom the music reflected their lives. Once I understand how the people lived I was able to interpret the songs more fully. When I was living in Berkeley on Fulton STreet I was approached by David Brooks about starting a jazz instrumental trio. The band was myself, Wayne Neckel (drums) from the Enchanters, and Dave Brooks on keyboard. Dave played a Vox Continental organ that he said he bought from Paul revere of Paul Revere and the Raiders. We worked on jazz and blues instrumentals. It was the first time I composed a piece of music and had it played with a group. The name of the song was “Moe’s Bookstore” which I wrote for my friend Moe Moskowitz who owned the bookstore on Telegraph Avenue in Berkeley. He was always very supportive of musicians and he always held great books and records aside for me to chose from that he thought I would be interested in. I dedicated that song to him. Moe has passed away but the bookstore still remains in Berkeley. He was an icon in the community. The trio also played in black nightclubs and played jazz and blues instrumentals. We were very well accepted by the audiences. We would play “So What” by Miles Davis and “Song for my Father” (the version by Coltrane) along with “Cantaloupe Island” and “Watermelon Man”. That exposed me to jazz. We also experimented with interesting time signatures like 5/4, 7/4, and 11/4 time. In 1967 I was living in Berkley and was still working at Kawneer Corporation. I was renting a large house and sharing it with friends. My friend Andre wanted to get a job as a valet with Little Richard who was performing at a club on Broadway in San Francisco. Andre was nervous about meeting Richard and asked me to go with him. He told me to bring my bass and amp to play for Richard in case he needed a bass player, and I happily complied. We went to Richard’s hotel on Van Ness Avenue and knocked on the door. The door opened about two inches, and a voice said, “Who is this?”. Andre identified himself. The door opened to allow us into the darkened room. The only light was from the television, tuned to static. The person who had let us in immediately closed the door and put a wet towel at the bottom because everyone in the room was smoking marijuana. Everybody except me was African-American. Out of the gloom a hand came up toward me, and a voice said “Hi, baby, how you doin’, I’m Richard.”, and that is how I met Little Richard. He asked me to set up my amp and my bass, which I did by feel in the dark. He then told me to play certain keys at certain tempos. “Play a 2/4 blues in A, now a ¾ blues in C, now a 4/4 in Bb.” Since Richard also had horns in his band he wanted to see my aptitude in playing in keys pertinent to them. After about 10 minutes and given the fact that I was concentrating, I realized that Richard was singing along with me. I was very gratified and when I finished he said, “You sound good! Would you like to play tomorrow night.” The next night I was on stage playing with Richard. We struck up a great friendship which continues to this day. In December of the same year, I went my fiance’s family home in Riverside, CA. Richard invited me to his mother’s house in Perris, CA, a community close by. I was invited to meet Mrs. Penniman, Richard’s two brothers and sister. Since it was Christmas I knew I had to get him an Christmas present. What to get Little Richard for Christmas was a dilemma. I decided to get him a copy of the Robert Johnson record album on Columbia. I had it gift-wrapped, I brought it to the house and gave it to him as a present. When he unwrapped the album, Richard got very emotional. He handed it to his mother who also got emotional. Concerned, I asked, “Is the present okay?” Mrs. Penniman replied, “This is what we listened to when Richard was growing up. You’re one of the family”. To this day I am honored to have had this experience. Mel Davis was the leader of a blues and rhythm and blues band that played in the Bay Area and some military bases. Everyone in the band was African-American except myself. Most of the clubs and places we played were African-American. I would be the only white person on the bandstand, in the club, and in the neighborhood. I remember one engagement that we played at an hotel located near the SF Airport. It was called the Thunderbolt Hotel. The reason it was called the Thunderbolt, was because it was located almost directly under the landing area of the airport. This meant that while we were playing sometimes the building would shake and we would be inundated by the sound of jet engines. We also performed at the Oakland Army Base and Hunter’s Point Naval Shipyard. At the Oakland Army Base, military personnel were being deployed to and returning from Viet Nam. We played enlisted men’s club. In the club, half of the soldier’s would be preparing to leave for VietNam and other’s would have just returned. The one’s going were spit and polish, all excited to go, while most of those coming back had the thousand yard stare. The band members were told not to go outside with some of these men because no one could predict how they might behave. Many had returned from serious combat situations. I would sit with some of them during my breaks between sets inside the club. I would thank them for their service and for their safe return home. Some would describe to me what they had been through. We attempted played whatever they asked us to play if we knew the songs. Many enjoyed R&B songs since they heard this music in VietNam. One song we played very well was the Otis Redding version of “Try A Little Tenderness”. I am glad to have had the opportunity to soothe some souls with music. After my experience with Richard, I was hired at Norman’s Restaurant on College Avenue in Berkeley CA. I was washing dishes and playing music at night. One day I received a phone call from a music friend to meet another player in a coffee shop on Telegraph Avenue. I met a young man whose name was David Sultzer. He said he had come from Santa Cruz to find musicians for a band that he was creating to perform original music. I was living in a small cottage in Berkeley with my fiance and said I would come and visit the house where David’s band was living. The house was located on Dwight Way at San Pablo Avenue in Berkeley. I walked in with my bass and my amp and David had setup his guitar and a tape machine where he played back some songs that had been written. All of the songs were original. I was very happy to know everything was original, because I had performed original material with Richard, and knew the potential of originals songs. I asked David if he had any ideas about what bass parts he wanted me to play. He replied, “That’s what you do.”. So I said, “Great, let’s do it”. The band had David Sultzer on rhythm guitar, Carol and David (singers), and David O’Connor, lead guitarist and myself on bass. We eventually hired Phil Ford as our drummer, who also played tabla. Phil added so much to the group. He also ended up playing some piano when we did our later recordings. My fiancée and I were asked to move into the band house. A few of the other band members lived with us from time to time. The only furniture in the house was amplifiers, a couple of beds, some chairs and a table. We had literally no money. I was bringing in food from the restaurant and my fiancée, was working part-time as a cashier. Every day we would assemble in the living room and play for 5-7 hours. Once I remember we made a tuna casserole in a large baking dish and divided it up by days. One afternoon we were playing in the living room and we had made an unconscious agreement that we were going to play and create until they found us slumped over; until we couldn’t play anymore. We believed in our music that deeply. The next day when we were playing there was a knock on the door. When we answered the door a young man said, “I’ve been standing outside your house for 45 minutes listening to your music. I’ve never heard anything like it. Is there anything I can do to help the band. We said “We don’t have much money.” He reached into his pocket and pulled out a hundred bill and half an ounce of grass. We invited him in to talk. When he left, we went around the corner, and stuffed ourselves with Chinese food. We couldn’t eat very much because our stomachs had shrunk. Our new benefactor returned the next day and gave us another hundred! It was such a relief to be believed in by absolute strangers. One of our friends in Santa Cruz found us a house that was for rent in a little town called Soquel. It was located on 7.5 acres in the Santa Cruz mountains. The property included a farmhouse and barn, with the water supplied from the stream up the mountain. We moved in and played constantly. Our daily schedule was this: we were awakened by a bell at 9:00 am. At 10:00 am we would have breakfast in the kitchen. After breakfast we’d go into the studio (living room) and we play from 10:00 am -1:00 pm. At 1:00 pm we had lunch until 2:00, then we went back into the studio from 2:00-6:00 pm. We had dinner at 7:00 pm, and then we were free to practice or do anything else after that. Frequently myself and other musicians would practice sections with each other. This occured six days a week, with Sundays off. We practiced this way for a solid three months and became very proficient in our songs and arrangements. We didn’t know it at the time but the band Traffic was doing the same thing in England. This is known amongst musicians as “wood shedding”. One of the things we created within our song arrangements was that the lead guitarist had an option of playing one of three lead guitar parts of his choice. We had previously learned all three of those parts and he would play the “cue” notes before one of the three leads, in order for us to play the correct backup parts. We had very few conflicts during this period because we were all dedicated completely to the music. My fiance’s parents had heard about the band and offered to invest in us, as a kind of a “wedding present”. They invested $6,000 (a lot of money in 1968). We were able to get good equipment and also hire a young lady to be the housekeeper. Her name was Vicky and she called herself “Vicky the Maid”. David Sultzer was also a surfer, ranked among the top 10 surfers in the world. He had met Buffy Sainte-Marie when he was surfing in Hawaii. She asked him what he was going to do with his life since he had told her he was also a musician. After they spoke, David determined that he was going to dedicate himself to playing music rather than surfing, because he realized he would have a longer career in music. He told Buffy that he was going to go back to the mainland, create a group, and when the band was ready he would call her. He told us that it was now time, the band was ready, and he called her. Buffy and her husband Dwayne flew from HawaiI and were picked up by our manager whose name was Richard Novak. (Richard is now a founder of a company called NHS, that produces the Santa Cruz line of skateboards, snowboards, and other products.) Richard picked up Buffy and her husband at the airport and brought them to our house. We were playing an instrumental section when Buffy came into the studio. She sat on the floor along the wall. We stopped playing. Buffy said “No, please keep playing.” We played or another 15 minutes, then stopped again. Her next words were, “That was really good. I liked that. Would you like to do an album?”. It was November, 1968. We recorded with her the next month. We were flown to Los Angeles and checked into the Magic Hotel on Highland Avenue in Hollywood. The engagement was for four nights at a club called The Troubadour. All of the shows were going to be recorded for live album for Vanguard Records. We had arrived a week before the performances/recordings. We practiced on the stage in the club during the day. The Troubadour later became the location for the North American tour by Elton John who had just released Tumbleweed Connection. The producer of Buffy’s album was Mark Roth, who had just produced an album for Richie Havens called “Richard P. Havens”. The recording was done by Wally Heider Mobile Recording. The tapes were recorded on 16 track 2 inch tape, which was a big deal in those days. The first three nights we performed two shows and on the last night we performed three. The shows were attended by various popular musicians including members of The Byrds and also Hoyt Axton. The William Morris Agency also sent representatives. Buffy’s show was favorably reviewed in the LA Times. After our recording with Buffy two of us were invited to tour with her worldwide. One was myself and the other was a guitarist named Bobby Bozina who had joined the band for the LA shows. I respectfully declined her offer because I felt loyalty to the MRF band members and wanted to continue to create original music with them. I was honored to have been asked to tour with her. The band reconvened at the original location in Santa Cruz in January 1969 and in March of the same year we relocated to Oakland, CA. I still had investor money for the band which I was allowed to use for rental needs and food for the group. We found a location at 666 63rd Street in Oakland. The band continued to practice and we reconfigured members of the band. A new member who wrote songs and played guitar was named Gareth Cook. He was a very creative and a very good singer. David Sultzer and myself continued to play. David later left to work as a solo act and was replaced by Russell Daneke. We then added another guitarist/singer named Lindsay Haisley. In later years, Lindsey became known for his work on the autoharp playing Appalachian music. He received the Maybelle Carter Award and is considered one of the top autoharp players in America. The band played a variety of country, blues, and ballads, along with some jazz. The original drummer from the Buffy recordings, Phil Ford, remained the drummer in the band. The group was booked for an audition at a club in San Francisco called the Matrix. We were booked for a Monday night audition/jam. The arrangement with the club owner was that we could audition but then had to leave our amps and drums on stage for the people jamming to use. We agreed to that and played our one hour. After our audition were then hired to play two shows within the next month. We used a different drummer for the Matrix. Phil had left because he wanted to explore playing tabla. He later played on an album with a band called Brewer & Shipley and also worked with Ali Akbar Khan at the Ali Akbar Kahn Institute in San Rafael, CA. Ali Akbar Kahn was a re-known sarod player. During the jam at the Matrix the new drummer and I went on stage and started playing. A person came up from the crowd and asked if Elvin could play with us. The “Elvin” was Elvin Bishop formerly with the Paul Butterfield Blues Band. I said of course. He came up and plugged in his guitar and came up to me and said to me, “Can Harvey play with us?”. I responded affirmatively. The “Harvey” was Harvey Mandel, formerly of Canned Heat and other well known groups. The jam was blues and I was able to play the two different distinct styles of the two guitarists. It was so well received that we were asked to continue playing that evening after closing. The club owner also provided drinks for the audience. Elvin and Harvey both gave me their phone numbers, and I gave them mine, thinking we might possibly work together. It was an honor to play with Blues royalty. The New Moon Rose Forest recorded some original songs. We acquired a fan who also owned a generator. We would load up a van with the band, our amps, and the generator to Stinson Beach in Northern CA. The generator allowed us to play music on the beach. One day Bill Graham, the owner of the Fillmore, was walking down the beach and heard us play. He asked us if we were interested in being an opening act at the Fillmore West. We agreed and played there once. The band went their separate ways about 6 months after the Fillmore West gig. After parting ways with Moon Rose Forest, I joined a new group called Martha’s Laundry, based out of Berkeley, CA. The members were Randall Smith, on drums; Jim Lehman, on lead guitar; David Kessner, on organ and rhythm guitar, and myself on bass. We played blues and some jazz. We studied the albums of Larry Coryell and Moby Grape. The band played at a variety of venues in the San Francisco Bay area. We opened once for Creedence Clearwater Revival. Occasionally the band would play in the public park in Berkeley on Sunday afternoons for free. The park was across from Berkeley City Hall and was nicknamed “Provo Park” because of the Provo’s who handed out free food during the week. One day a group came from San Francisco in their van and wanted to play. It was Carlos Santana and his relatives with their band called Santana Blues Band. They were nice and we told them that when they wished to play again not to bring their amplifiers because they could use ours. We performed at the Straight Theater, The Family Dog, which held events at the Avalon Ballroom in San Francisco. The band was on a couple of posters that were printed during the 1960’s and was actually featured on posters from Straight Theater. Martha’s Laundry ended up having among its former members individuals who have become well-known in the music industry. Randy Smith who played drums, later founded a company that built instrument amplifiers called Mesa Engineering. Randy and Carlos Santana had became friends and when Randy developed his first amplifiers, he invited Carlos to try them out. Carlos played through the first Mesa amp, which was a small one that sat on a table. It was able to sustain notes without having to be loud. At that time the only method of sustaining notes with electric instruments was to turn the amplifier up really loud which created a feedback that was used by the musician to perform songs. Examples of that was the use of large amplifiers built by Marshall. Artists who used this method included Jimi Hendrix and Eric Clapton. The method made it difficult to record their music due to the high volumes necessary. Randy devised a method of utilizing the first stage of the amplifier (pre amp) that could electronically sustain notes at very low volume. The output signal from that section of the amplifier then went to the second stage (power) which merely amplified the signal and sent it the speakers. The result was that the musician could sustain notes at low volume. After playing through the newly designed amplifier Carlos said to Randy, “This amp really boogies”. Randy said, “Great! I will call the amps Mesa Boogie.”. These amps are now considered to be some of the finest guitar and bass amps in the music industry. They are used by the Rolling Stones, Paul McCartney, Santana of course, and many other top musicians. One of the other members who played guitar, Jim Lehman, has become a recognized authority on old electric guitars. He now owns a company called Guitar Rez in Austin, TX. Dave Kessner, who had been the keyboardist, became a real estate broker in Marin County, CA and also the keyboardist for a group called Cold Blood, which was one of the large groups of the era that played R&B and Rock, using horns. Other bands of that type included: Ten Wheel Drive, The Electric Flag, Blood Sweat and Tears, and Chicago. After Martha’s Laundry ended, I began employment at Davis Instruments Corporation in San Leandro, CA. I was also playing music with a musician named Dan Gabrezak. We performed as a trio with a female singer and played in Los Gatos and San Jose, CA. Dan played 12-string guitar and sang, the female vocalist sang and I played bass. I was becoming exhausted from playing music every night and also working at Davis. I was subsequently (luckily?) laid off from Davis Instruments and Dan and I parted ways as bandmates around the same time. By this time I had used up all of the investor money given to me to operate the original Moon Rose Forest. Around the same time my mother passed away leaving me a small inheritance. I was once again at a musical cross roads. I had no group that I was playing and was looking for new opportunities. A friend told me of a new group called Crosby, Stills, and Nash. He told me they were seeking a bass player. I was told to contact a reporter at the Rolling Stone newspaper in San Francisco whose name was Ben Fong-Torres. I called and made an appointment with Ben and visited him at the Rolling Stone offices. Ben called Stephen Stills. Stephen said that they had already hired a bassist and drummer and if the players didn’t work out I would be first in line for consideration. I was somewhat crestfallen by this news. Ben asked me if I would be interested in posting an ad in a section of the paper called “Musician’s Free Classified”. I said sure, and Ben said “What do you want to say?”. I dictated my ad to him as follows :“Bass player looking for group. Have played with Little Richard, Buffy Sainte-Marie and others, etc”. We took a copy down to the the composing room of the newspaper and gave it to the printer. I forgot about the ad until two weeks later when I received a telephone call from New Mexico. The person on the other end of the line said he was a producer and manager and needed a bass player to tour the Southwest. The band was located in Las Cruces, New Mexico. Since my mother had recently passed away, I had some funds available to explore this musical possibility. I considered it to be another musical adventure. Purchasing a round-trip plane ticket, I also arranged for the shipment of my bass and amplifier from Oakland to El Paso, Texas. After arriving in El Paso, was picked up by the band members in their van and taken to Las Cruces. The members of the band also hailed from different parts of the country. The drummer was from Philadelphia and the guitarist was from New York. The three of us quickly found out that we were to be the backing group for a brother and sister vocal act and that they were also the son and daughter of the manager. The only “problem” was that they were terrible singers and worse musicians. The three of us were pros. I realized that this project was not going to viable. What I did discover was that I really enjoyed being in New Mexico. We arrived late at night. When we got close to Acoma my Indian mom said, “We are on Indian land now.” She knew exactly where we were. I had no idea, but she knew where the reservation started. We arrived at the house where I was welcomed by the family to phrases including, “Your brother is here, your brother has come home.”. I went to sleep exhausted along with everyone else. The next morning I got up and we had breakfast in the kitchen. It had a wood burning stove and an electric stove. Larry then said, “Come, I will show you Acoma. Remember,I had arrived in the darkness of night and when I stepped out of the house, I could see 60 miles between the mesas through crystal clear air. We were also at 7,000 feet elevation. The horizon stretched in all directions. It use a hippie phrase it was mind blowing! I was driven to the ancestral family home on top of Acoma Mesa, which is also known as Sky City. The ancestral home was hundreds of years old. The oldest buildings on top of the mesa were over 900 years old. I touched the walls of the home and tried to feel the emotions of all the people who had lived in those rooms. It was one of the most spiritually beautiful places I could imagine, lending itself to creativity and song writing. I was honored to be part of the Sanchez family and to be accepted by other members of the tribe. I remained with the family for three weeks. During that time I called my wife, Vickie, to tell her I was at Acoma. She asked me when I was coming back to the Bay Area. I said “I am home. I’m coming to get you and bring you back here. ”. I then went back to the Bay Area, gathered Vickie and our property, and returned to Acoma within a month. We then lived with the family at Acoma for about another month before moving into Albuquerque. The new band that Larry and I formed was called Acoma. The album that we started but never finished was called Yellow Corn, which was the name of Larry’s clan within the tribe. We had three members in our group, an hispanic drummer, myself, and Larry. The three of us represented the three cultures of New Mexico. As the group rehearsed Larry and I wrote all of the songs. This was the same process that I was part of with Moon Rose Forest in Soquel. Larry and I would occasionally go to a music store and pawn shop in Albuquerque called Black Jack Music and Pawn. it was there that we met a producer named Al Klein who had worked for Motown Records in Detroit. He heard us playing in the store, liked our music and offered to get us a record contract. We readily agreed. Not bad for a visit to a music store! The record company was called Certron Records which was a division of the Certron Company who manufactured 8 track cartridges. The Certron business model was similar to that of Sony Music and Sony Pictures which were formed years later. We signed a contract with Certron and started to record an album. The studio where we recorded in Albuquerque was called Hurricane Studios. It was named after a local musician and performer whose name was Al Hurricane. He had a salsa band and was well known in the Southwest. At the same time, Al Klein decided to make a video to promote the album to possibly enable us to perform live on the Johnny Cash Show which was broadcast nationally on the ABC television network. In those days before MTV no one knew what a video was. Al hired a video remote truck from a new company in Albuquerque. The truck was able to be driven up the road to the top of Acoma where the video was produced. I was with the band and the camera operators were outside of the truck getting shots of the surrounding area of the mesa and the buildings in the village. I went into the truck and met the director. His name was Harry Norviel. Harry asked me what shots should be used for the video. He then asked me if I would like to direct the video. I agreed and he said, “Put on the headset.”. I sat down and chose camera shots for the video, which were shots of Acoma over one of the songs from our album. Ironically, when I directed the video it seemed very natural to me and the finished product came out well. It was an honor to manifest the vision at was connected to our music. As the production of the album progressed Al decided to use LA session players. I protested that the vision of the album would not be the same if this were done. Al moved forward anyway and I had no other choice but to leave the project. Larry opted to remain. The final result was a 45 record released on Certron ironically had my parts and arrangements on it. That was done because Larry’s father (a chief) and his brother (the governor of the pueblo) had insisted that it be done. After parting ways with Al and Larry, I continued to live in Albuquerque. Al passed away about three months later, Larry remained on the reservation, and the full album was never released. While living in Albuquerque I need money for living expenses so washed dishes for one of the University of New Mexico’s dining halls to make the rent. I hung out at the local music store where Larry and I had met Al. During that time I met an engineer named Larry Fisher who was building a recording studio in Albuquerque. I told him I knew something about audio and video and he hired me to help him construct the studio called Dell Sound Studios which was a four-track facility. One of the other partners in the project was named Clifford Booth. I was to help wire and connect all of the audio components for the studio. My payment was partially in cash and partially in hours of studio time. During winter of 1970, I had moved to a small town outside of Albuquerque called Corrales. It was difficult for me sometimes to get home from the studio. On a few nights I would decide to sleep overnight there. It is very, very quiet in a recording studio, especially when you are trying to sleep! One day a group came into record at Dell Sound Studios. They were called Che Marque and had three members in their band. They asked me to play bass with them. The leader of the group wrote two original songs. One was called “The River” which was an anti-pollution song. I played bass on that recording. The title of the other song was called “Merry-Go-Round”. One engagement that we were hired to play was a Las Vegas night to benefit an organization in Albuquerque. We had been asked to wear white shirts and black slacks. When we arrived at the gig we went backstage and were given sarapes made to look like a playing card to wear over our outfits. These were beautifully made and we were somewhat surprised to be asked to wear them for our engagement. I like to think that I was wearing the King of Hearts. We fulfilled the design motif of the event. I chalked it up to a real “show-business” experience and wish I still had that costume. In 1970 I was living in Albuquerque at the home of Matt Chacon and playing shows with him and looking around for opportunities. I received a telephone call at Matt’s house. I answered the phone and the voice on the other end said, “This is the Associated Students of the University of New Mexico. We’re looking for Michael Husser.”. I was known to the university because I had recorded and played on the local college radio station with Larry Sanchez when I did the Enchanters recordings. They had found my phone number and were calling me because a group that had been engaged to perform had cancelled. I asked them when the show was and they said, “It’s this Saturday night.”. (I received the call on Tuesday.) They then asked me if I had a band. Before I could reply they said, “The show pays $600.”. My immediate response was “Yes, I do have a band.”. I then asked them the hours of the engagement, and how many sets were to be played. We agreed on three sets, of forty five minutes each. I asked when we were to arrive at the venue and then said we’d be there an hour before our first show. The event was called “The Cherry Bash Sock-Hop” and was sponsored by the university. In reality I had no band but knew I could get one together for an engagement that paid that much money. I called the local guitar store Black Jack Music (where Larry and I had been “discovered”) and told them I was in need of a drummer and two guitarists to play 50’s music. I said I would be there in 30 minutes. By the time I arrived they had called five guitar players. I auditioned them and two subsequently were hired to be in the band. One of them gave me a referral to a drummer. I called him and we talked and I told him we would have a rehearsal the next day at Dell Sound Studios in Albuquerque. I had called Dell Sound and they set aside the time. We had two hours to put together three sets of 1950’s music. My requirements were that everyone except the drummer had to know how to sing and also to play well. I needed a costume in order to dress like the 50s. I went to Goodwill and bought a milkman’s pair of baggy white slacks and a pair of old black and white saddle shoes. I got a white shirt, a red tie, and I found a white waiter’s jacket, all for about $10.00. The clothing didn’t fit that well but I didn’t care. I also bought Brill Cream for my hair (that is when I had hair!). I later named the various musicians in the band by asking them where they came from and what they did. One of the guitarists was named Fred and he had lived in Miami Beach, so he was nicknamed “Fast Finger Freddie from Florida”. The other guitarist was named Charles and he had lived in Chicago, so he was nicknamed “Chicago Charlie”. When Robert the drummer played with us, he would bounce on his drum seat as he played, so his name became “Bouncin’ Bob”. I took the name Ralph from Ralph Kramden from the 50’s show called “The Honeymooners”. The name Rocket came from Sandia Labs and Kirtland Air Force Base in Albuquerque where space technology was being researched. At the dance anyone who had a crew cut got in for free and military got in free. The name of the band thus became “Ralph Rocket and The Crewcuts”. We arrived at the main facility at UNM called The Pit, which is where the basketball games were held at the University. The students who had hired us had forgotten to mention that two thousand people were going to be there! We were to play the first set and then a DJ would come on and do various contests like spotlight dance, free dance, girls’ choice, boys’ choice, etc. ,using ‘50’s music. After his show, the students presented a 20 minute film clip from a movie called “Junior Prom”. After the clip we played again. Members of the UNM Drama Club came dressed as characters from the ‘50’s. Girls wore poodle skirts and guys dressed up like greasers with their t-shirts rolled up and a cigarette pack in the sleeve. They also had a make-up artist who provided makeovers to the girls in the audience who wanted to participate as 1950’s characters. This added color to the environment. After we had played our second show, the president of UNM who had heard about this event came and welcomed everyone to “New Mexico High School”. The local TV station was also present along with the local newspaper. I was interviewed by both media outlets and maintained the persona of Ralph Rocket. When the event was over, we were paid, everybody went home, and for the next four of five months people would see me in public and say, “There goes Ralph Rocket”. Anywhere I went to play, people would say, “Ralph Rocket’s going to play! Let’s go see him”. I was working in various food service jobs and at the studio, when I met an guitarist/singer/songwriter named Matt Chacon. We got together and played his original songs. One of the songs which we recorded was called “Henry Macey” and the other one was called “I Wanna Go Home”. Both of these songs were produced at Dell Sound Studios. After the recording was released, Matt was asked to perform the songs on a local TV program called The “Val De La O Show”. It was an all Spanish program that aired in Albuquerque on KOB-TV, Channel 4. Matt asked me to accompany him when he played on the program. I went to the station and played with him during the show. One of the people in the studio during the recording was David Wilkins, who happened to be the production manager of the station. Two weeks later I was introduced to him again by another engineer at the station whose name was Steve Smith, who I had met at another job. Dave asked me what my technical background was since he had first seen me as a performing musician. I told him I worked at Dell Sound Studios as a recording and mixing engineer and made demo tapes for groups. He was gratified because (unbeknownst to me) he needed an audio engineer to work at the station. Dave insisted that I fill out a job application that day. A week later, he called me and offered me a job at the station for the princely sum of $2.00 an hour. My first foray into TV broadcasting was in October of 1971. I continued to play with Matt Chacon at various shows and concerts. One of the concerts was at the University of New Mexico main campus. Matt and I opened for Carlos Santana’s group, called Azteca, a 10-piece Latin band. I was working at KOB-TV and got a phone call at home from Josh O’neil who was a drummer and singer and one of the few black musicians working in Albuquerque at that time. His piano player was named Fred Wright. Josh told me that they had an engagement at the Lomas Bowl at Lomas Boulevard in Albuquerque in the lounge and needed a bass player. He said it was blues and jazz and “the gig pays .25 cents”. In the parlance of the blues, “.25 cents” means $25.00 a night. So, with no rehearsal at all is started playing the engagement five nights a week. My schedule at the station was as follows: go to work at 3:30 pm, do the early news 5:00 pm audio, then pay a fellow engineer to cover my position until I returned at 1:00 am to do the commercial compositing for the next day. After I had played jazz and blues music for 4 hours in the club, I had to train myself to “change my mind” back into the logical mindset of a video engineer. I had 15 minutes to do that while I was driving back from the club to the station. It was hard but I had to do it. That experience allowed my to understand my creative and logical processes simultaneously. A new at reporter at KOB who was African- American decided to a series of stories on entertainment venues in the city. I believe it was called “Albuquerque After Dark”. I heard about his project and told him I was playing in a jazz trio. He came down to the club, listened to us play, and then asked us if we were interested in being part of the program. Josh and Fred said of course, and they did not really know what it meant to be on a television news segment. The reporter gave me the date that the crew would be coming in to set up the lighting and camera. I informed the manager of the lounge and the manager of the bowling facility that KOB was coming to record a special segment in the lounge. They were very excited. I told Josh and Fred when the crew was coming and we should 3-4 of our best songs. They agreed, not really believing (or understanding” what was going to occur. The night that the crew showed up with the lights and cameras they then became believers. The band played and Josh and Fred were both interviewed on camera. The segment played many times during the next week. One of the results was that the lounge where we performed became packed with patrons every night. We did quite well earning tips on top of our “.25 cents”. The Cow Towners was a classic country band that performed around Albuquerque that played Jimmy Rogers, Hank Williams, and other songs. They were from the surrounding rural areas and their music reflected their environment and background. We would play at a club called the Cow Palace located on the outskirts of Albuquerqe that was such an authentic country bar that it had a sign asking the patrons to check their guns at the door. We played various parties and other engagements in the area. It was my re-introduction to playing with people whose music represented them and who they were. After I’d been employed at KOB for about a year and a half I was seeking larger TV markets for my skills. I now had a wife and child and needed a higher salary level. During my time at the station, I had become well-versed in many aspects of TV production. In a small station one must know a variety of operations. My job description had been changed to Director. My wife’s sister and her husband lived in Salt Lake City, UT, and we went to visit them. During the visit I went to the local stations with my resume and was soundly rejected by all of them with the exception of KSL-TV. The production manager was very cordial, gave me a tour of their facility, and insisted that I fill out a job application in his office. It turned out that the station was the number one station in the Utahmarket and was owned by the Mormon church. It had all the finest broadcast equipment and was a CBS network affiliate. I returned to Albuquerque after the visit and received a phone call from KSL offering me the new job the next week. Three weeks later we were living in Salt Lake and I was working. I began my job as a camera operator and was later offered a position in the videotape department, and also became an audio engineer for the local newscasts. I was still looking for people to play music with to maintain my chops and make a little extra cash. I got a call from a country singer named Dottie East. At the time there was famous country performer called Dottie West. We played at a club Salty Sands located on 2nd South by the Salt Palace where Utah Jazz basketball team played. 2nd South was known as the party area in Salt Lake. It was known as a “bottle club” where patrons would pay to be admitted and also had to pay for individual alcoholic drinks. The alcohol beverage laws in utah were murky at best and frustrating at worst. I played with Dottie and her band for 6 months off and on in the club. I would invite coworkers from the station to come and see the band and they first question they’d asked was, “Do they drink in this club?”. I would say, “Yes, but you don’t have to.”. I would get them a free entry pass, so they could come and enjoy themselves and watch the band play. The next day at work I would see them and ask them how they liked the band. Their response would be “What band? I was never there.”. I worked at the station for 11 months before departing for Canada. My wife had a distant cousin who lived in Vancouver, British Columbia. She said that if I could get a job in the area we would have a place to stay until we found our own place. I felt that I had progressed as far as I could at KSL-TV. With that in mind I picked up the phone and called BCTV from Salt Lake City. “British Columbia Television Broadcasting Ltd.” was located in Burnaby BC.. It was , for all intents and purposes, a “cold call”. I got the production manager on the phone, explained who I was, and said I was looking work at their station. He said he’s send me an application and made no further promises of employment. I filled out the application and included my resume and photograph. Two weeks later got a phone call from him that I was offered a job at the station. Three weeks after that call and letter, I was in Canada. Each time I had moved, in my television career, I doubled my salary. This was because I had acquired new skills. While working in Vancouver, I also played with some local groups and kept my musical skills intact. Eagle Rock was a local group in Burnaby that needed a bass player. I joined the band and we played a lot of blues, most notably a song called “Six Days on the Road’. A well-known version of the song had been recorded by Taj Mahal. At BCTV a local promoter was producing a program about music in Vancouver. I mentioned that I was in a band. He came to see us perform and offered us the opportunity to play on the program. We accepted and performed. The show played for the next two weeks and we received many engagements, and became very well -known in Vancouver. During the time I was laid off from BCTV, the same sister of my wife and her husband had moved from Salt Lake to San Diego. They invited us to their home. We moved to San Diego. The husband was a salesman and was selling racks and display units of women’s pantyhose. He was selling these racks of pantyhose to mom and pop grocery stores and refilling the racks. He asked me if I wanted to come with him on a couple of sales runs. I agreed and began to learn about the product. He got a lead to go to the purchasing department of a supermarket chain. It was called Stater Brothers and he asked me to go with him. We drove to the purchasing department. Five minutes before our meeting, he told me he was too nervous and told me I had to make the presentation. I ended up selling a large number of pantyhose displays to the supermarket chain. While in the “pantyhose business”, I decided to visit the local TV stations in San Diego to see if there were job opportunities. One of them was called KGTV-TV Channel 10. It was an NBC affiliate. Later the station was purchased McGraw Hill, a major book publisher. I went in and interviewed with the production staff. Thinking that I might be settling down, I received a call that they wanted to employ me at the United Nations COnference in Vancouver. I was hired as an audio engineer for a contractor who was responsible for the sound called Kelley De Young. The name of the conference was Habitat. I was employed to operate the audio systems for translation and recording of speeches made by UN representatives and diplomats. At the conference I had the honor of meeting and speaking to Buckminster Fuller. When I was setting up the recording of Professor Fuller, I went to meet him and put the microphone on the lapel of his coat. He asked me what I did, and I told him that I was an audio engineer and musician. He said, “My name’s, Bucky.” I ended up talking to him for almost half an hour about system of audio as it related to the psycho-acoustical dynamics of sound. We seemed to understand each other easily. Buckminster Fuller encapsulated the idea that “the mind of genius is simple”. During the UN conference I got a call from KGTV offering me employment at Channel 10. I had one week to return to San Diego. I worked for the station for about six months. During the time of my employment, the station was purchased by McGraw-Hill. The new corporation had told to reduce staff. Since I was a newer member of the staff I was slated to be laid off. Fortunately I was also playing in local bands in San Diego. When I got my three week notice I informed the bands that I was able and willing to work full-time with them in order to pay my bills and feed my family. My last day of work at the station was on a Saturday in October of 1976. Six days later, on a Friday, I was hired by NBC and began work the following Monday. I had been at NBC for about six months and was considered to be a temporary employee. One day I was called into the Recording Department’s office for a meeting. The manager looked like the typical engineer of the time: short hair, glasses, pocket protector, pens, and tie. He asked me, “I understand you play music. Is that true?” I replied affirmatively but was worried because I didn’t know what that meant. He then said, “ We are doing a show called “The Midnight Special. Would you be interested in working on that show?”. At that time, Midnight Special was one of the highest rated showed on the NBC network. It was hosted by Wolfman Jack, a radio personality. The best Pop and Rock musicians performed on the show. We would record each show twice, called “dress and air”. Then when the shows were over, we would be edited different parts of the musical performances to make them look their best. The audio was recorded on a 16-track recorder. The outermost track on the tape was used for time code, which also the same for the video tape machines recording the show. The track next to it was left empty as a “guard track” and the remaining 14 channels were the material from the performance. The 14 tracks were then mixed to a 2 track stereo tapes with time code, and the video tapes audio was mixed to mono. The tapes were 2 inch wide video tapes. When the program aired the stereo audio tapes were played in sync with the videotape and then fed to the NBC radio NEtwork. That process enabled the audience to listen to the show in stereo on their local NBC radio stations and watch the show simultaneously. if they didn’t have an NBC radio station available in their area , they could always hear the regular mono-mix from their television sets. In 1985, I was approached by the President of the NBC Fun Club and asked if I had any ideas for an event. I replied that I thought it would be interesting to have a “fifties night” at a local club called the Palomino Club in North Hollywood, CA. He asked if I’d do the music and what I would call the band. I said Ralph Rocket, because I found out that the group the Crew Cuts were still performing . I rehearsed a new band which was composed a horn section (tenor sax and trumpet), keyboard, guitar, bass, and drums. We rehearsed two shows of 50’s and R&B songs. We also created a song-book for the audience to sing along with the band during a special section of the show. They sang along to “Charlie Brown” and other 1950’s classics. 250 people from NBC attended. One of the issues I had in finding a drummer was when I advertised looking for one and told them I was playing for NBC, they would be intimidated. Finally I found a drummer and didn’t tell him who we were playing for until the rehearsal. We rehearsed and performed and made recordings on video and audio. After that event, if a person called NBC network and asked for Ralph Rocket, they would switch the phone call to me in the videotape department. During the time I was at NBC, i played with various groups that were comprised of employee musicians. One of these was called Line-Lock that performed for a couple of NBC employee events. I worked at NBC Burbank from October of 1976 and stayed at the network until 1992. NBC was purchased by General Electric as part of its acquisition of RCA Corporation. When I left NBC, I accepted a buyout from G.E. Prior to my departure I had taken classes paid for by NBC in the areas of TV production. One of the classes was in Line-producing, which is the process of tracking expenditures of the production. It involves knowing the day to day costs of the production and aligning costs with the original budget. It combines accounting and creativity. Jerry was a founding member of a popular 1960’s group called The Youngbloods. They were known for a song they performed called “Get Together” , which was a big hit for the band. It was very high on the Billboard Charts. Jerry was the guitarist in the group and I consider him to have been the musical director of the band. When I was employed at NBC, I was living in Palmdale CA. Jerry was living in Lake Hughes, CA about 10 miles away. He had been a producer for Buffy Sainte-Marie in the 1960’s and was produced her recordings in New York after I had recorded with her in Los Angeles. Jerry and I were introduced by a mutual friend named Brad Bailey who was a songwriter. Brad had written songs for a group called The Nelsons. They were the two sons of Ricky Nelson who was also a well-known musician and actor and had starred in a television program called “The Adventures of Ozzie and Harriet”. Brad, Jerry, and I started playing and recording together. The three of us performed Jerry’s original songs. We recorded some of them and played concerts in Northern California. Jerry was one of my best friends in music and later moved from California to Texas. While in living in Lake Hughes, Jerry gave me a cassette tape of some original songs that he had written. I kept the tape and asked him if he wanted it back. He said no because he was writing more songs. Jerry passed away while living in Texas from injuries sustained while riding a horse. I listened to the cassette years later (before he died) and transferred a song from it called “Dancing in the Light of Love”. My partner and I recorded it and sent it to him. He said he was proud and honored that we had done his song. He also said that he did not remember writing the song. He was so pleased with our version of it that he gave me the song. I created Native American network in order to organize and provide a television network for the Native American population of North America. My goal was that tribes would be empowered to teach their members to produce videos about their tribal history, customs, relationship with nature, and the “modern day world”. I wrote the business plan and went to Acoma to visit my Indian brother Larry Sanchez. Larry had obtained a position with the tribe and had caused a hotel to be constructed that provided revenue for the tribe. The hotel was called the Sky City Hotel and Casino and is now located on Interstate 40 at exit 102 in Grants, NM. We sought funding for the startup operating expenses for the network and went to various conventions and meetings with the banking industry and government representatives. At the same time, I was also visiting friends in the New Mexico area. It was determined later that funding would not be readily available. I had spent time in the development of the network and learned alot about business plan development and presentation. One of the people that I contacted in New Mexico was a member of the Green Party. After I had returned to Palmdale, she called me and offered me a job with the party. I accepted the position and moved to Belen, NM. One of my responsibilities was to create the television commercials that aired during the campaign. At the same time, I was also playing in various musical groups in the area. The Green Party candidate receive 11% of the vote and our budget for the whole campaign was $75,000. The winner was Gary Johnson who was running as a Republican that year. He later offered me a position in his administration. I had met Mr. Johnson many times during the campaign debates. I politely turned him down and moved back to the Bay Area in December of the same year. During this time I also had my bass and amplifier with me and played daily.